Comfrey is a perennial plant that belongs to the family known as the Boraginaceae. Plants in this family are characterised by being particularly hairy. It is grows in damp places - like ditches, river banks, the sides of streams. Comfrey can grow to a height of 1.5 metres - with a strong central (and hairy) stem . The basal leaves (near the ground) are stalked and large (see image below) - being some 15 to 25 cm in length; they are also soft and hairy. Leaves higher up the stem are narrower and lack obvious leaf stalks (petioles) - see featured image (adjacent). 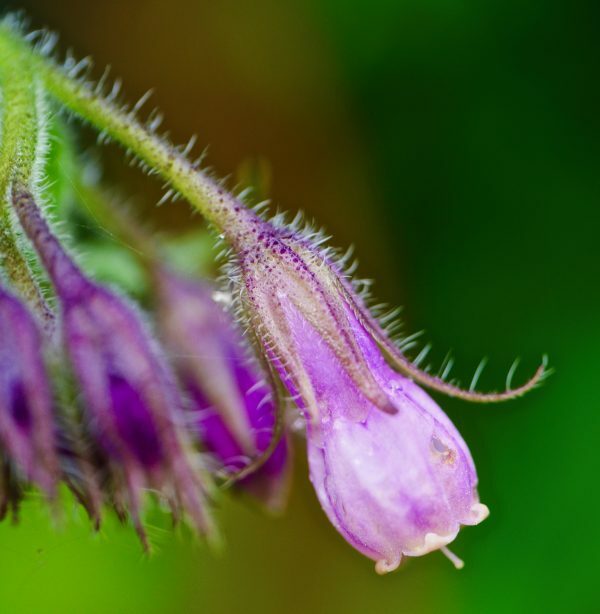 The flowers of comfrey vary in colour from white, to yellow and purple. 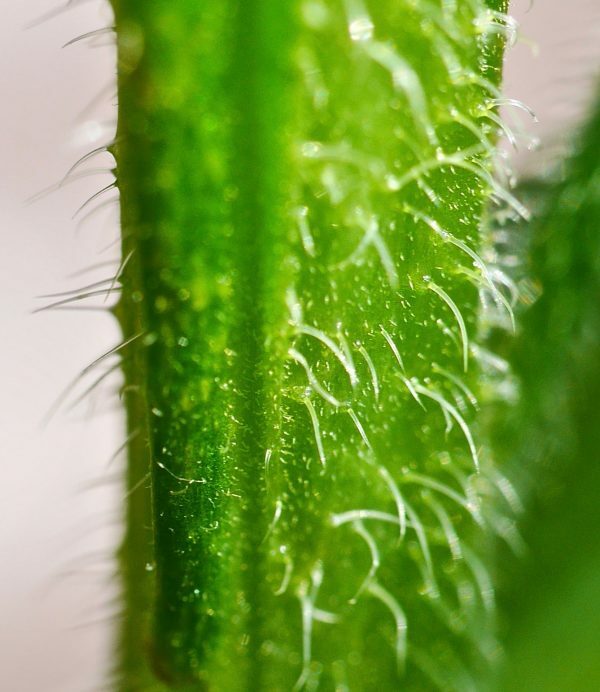 They have five sepals (which form the calyx) which are fused at the base, but have ‘hairy teeth’ (see photo below). The corolla is formed from five petals, again fused to give a bell-shaped structure - with short ‘teeth’ / lobes on the lips of the flower (see image immediately below). 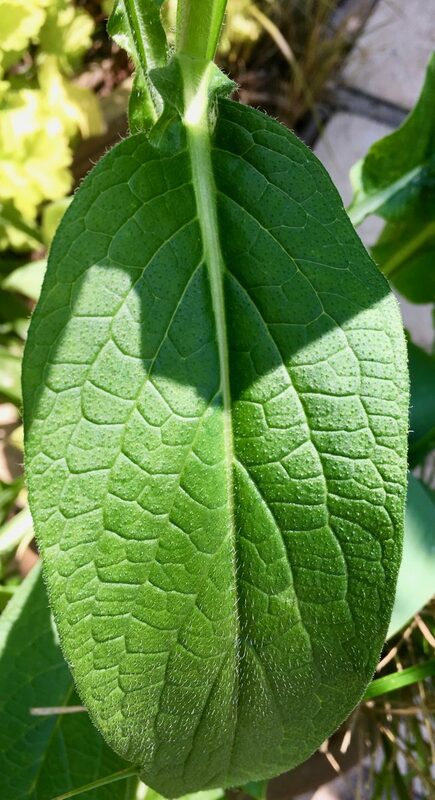 Comfrey is often grown by gardeners and then used to ‘create’ a fertiliser; the leaves rot down quite quickly and are a rich source of potassium (K+). Potassium is associated with flower and seed production. Comfrey has also been much used in herbal medicine. 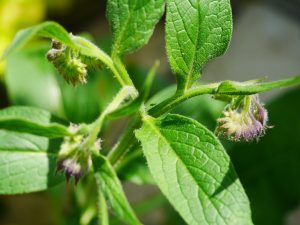 Two of the ‘common names’ for comfrey are knitbone and boneset, and it was used externally to make a poultice. It is said to encourage wound healing and have anti-inflammatory effects. There were other uses - it was sometimes taken internally for gastro-intestinal problems (amongst other conditions). However, concoctions of herbal tea with comfrey or similar preparations have been associated with certain toxic reactions / poisoning, resulting in VOD (Vaso-Occlusive Disease) in which blood vessels and the liver are damaged. Comfrey contains pyrrolizidine alkaloids (symphytine) which are thought to cause this damage.